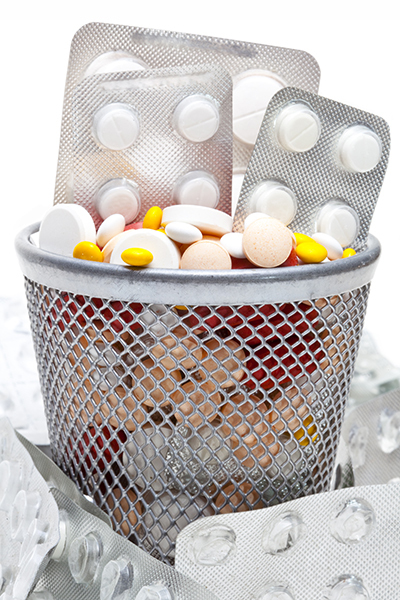 Does your medicine cabinet contain medications that are past the expiration date or simply no longer needed or wanted? Taking care in disposing of them brings more benefits than additional shelf space. A few extra steps will help protect your identity, prevent harm to kids and animals who may come across the medications, and protect the environment from contamination. Visit the Massachusetts Office of Energy and Environmental Affairs' website for an interactive map of disposal locations or download a list of kiosks throughout the state. Go to the U.S. Department of Justice Diversion Control Division's website to search for locations within five to 50 miles of your city or zip code. Call your police department or local board of health. If a medicine take-back program is not available in your community, check the information that came with your prescription or over-the-counter medicine for specific instructions. The Food and Drug Administration provides directions for preparing medications to be thrown in household trash and a list of medications that can be flushed. Chemotherapy and anti-cancer drugs require special handling and disposal. Oral chemotherapy should be considered hazardous waste and should not be flushed or thrown away. Return unused medication to the oncology clinic, pharmacy, or community take-back program. Be sure to remove or scratch out any personal information on the packaging before disposal. This will help protect your identity. This information is intended for education purposes only. For medical advice, please contact your health care provider.